So, remember a couple months ago, when my friend Matthew challenged me to make some salads? I made a whole slew of salads in a flurry of activity, and there were some definite winners in the bunch. Tried as I might to make them hearty and filling, though, they just couldn’t quite stand on their own: never quite enough protein. Enter this chicken, my ace in the hole. While they’re great fresh and hot as a main dish, in my house they more commonly end up in a container in the fridge, waiting to bump up the protein content of whatever I happen to be putting together. A big leafy salad? Throw some chicken on it! Bowl of rice with some spicy pickled vegetables? Better with some chopped chicken! Omelets, wraps, platesful of little nibbles, pizzas and pastas: all easily ramped up with a few couple big spoonfuls of chopped chicken. But this isn’t just bland ol’ grilled chicken breast, I assure you. 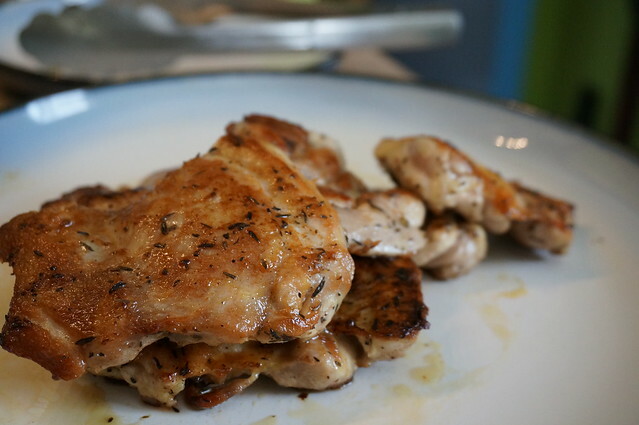 First off, I’m recommending you skip the breasts and go for boneless-skinless chicken thighs instead. They’re just as easy to work with (in fact, I sometimes think they’re easier, since the thickness is more uniform), but the flavor is leaps and bounds more exciting: rich and flavorful, and it’s hard to overcook a chicken thigh, so you don’t get the dry, unappetizing texture that sometimes happens with salad chicken. 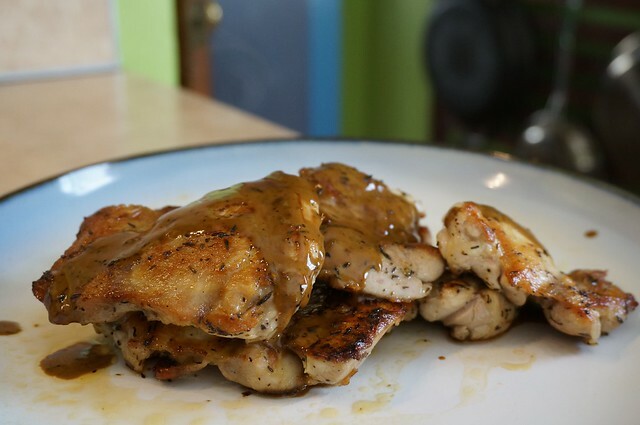 The lemony marinade takes only seconds to throw together, but it pays off big: the chicken ends up tasting light yet substantial, which is a combination I always want in the warm months, especially when you pour over the pan sauce. Huge rewards, very little effort: my kind of recipe. Chicken thighs! They’re like chicken breasts, but better: every bit as easy to use as chicken breasts, but also all-but-impossible to overcook, and tasting more like, well, chicken. This particular preparation is quite versatile — left whole, the chicken would make a lovely main dish (maybe with some couscous and a simple green salad with some cherry tomatoes? but that’s just me). 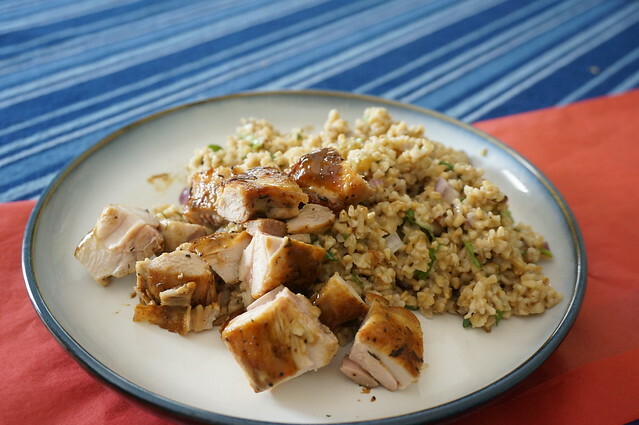 Moreso, though, I love this chicken as an addition to salads, grain bowls, omelets, pizza, pasta, and all manner of brown bag lunches: it adds a little protein and a lot of pizzazz. Don’t be fooled by the length: this recipe is incredibly simple. It only looks long because I’m giving some cooking tips; if you’re an old hang at this sort of thing, the ingredient list tells you most everything you need to know. Place the chicken thighs in a zip-top bag, or in a glass or ceramic baking dish large enough to hold them in a single layer. 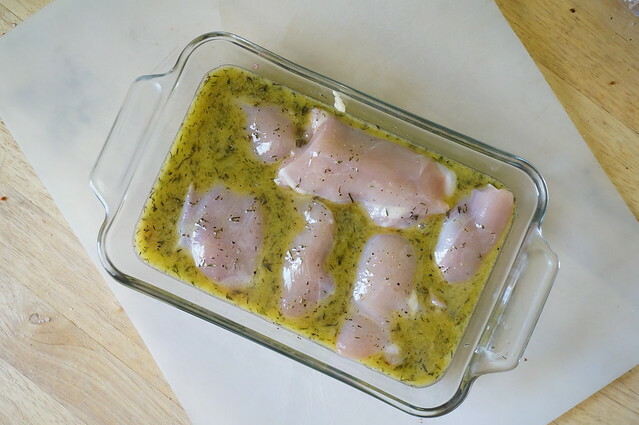 Combine 3 Tbsp olive oil and 2 Tbsp lemon juice with the salt, pepper, and thyme, and pour the marinade over the chicken. Seal the bag or cover the dish, and marinate in the refrigerator for 1-2 hours. In a large skillet, heat a couple tablespoons of olive oil over medium-high heat until it is very shimmery, but not quite smoking. Lay the chicken in the skillet without crowding it — you may need to work in batches. Let the chicken sear for 3-6 minutes without moving it, until it has a nice dark brown crust and releases fairly easy. Flip the thighs and cook for another 3-6 on the other side. If the pan looks a little dry, add more olive oil so the chicken will continue to sear, not char. The total time needed will depend on the thickness of the meat. Generally the meat will be done by the time it is well-browned on both sides, but if you’re unsure use the tip of a knife to cut into the thickest part of the meat; if the juices are clear and the meat firm, it is done. When the meat is cooked, remove it to a plate or cutting board to rest for 5 minutes. If you intend to use the chicken as a salad ingredient, etc., roughly chop the meat after it has rested. Heat the same skillet you used to cook the chicken and pour in 2 Tbsp lemon juice. Stir and scrape with a wooden spatula to release all the browned bits. Add the heavy cream to the skillet and stir until the pan sauce is thick and creamy, then remove from heat, return the chicken to the skillet along with any juices that have collected while it rested, and toss to coat. Feeling fancy? You could also lay the thighs out on a platter and drizzle the sauce over them if that’s your style. Heavy cream works best here, but you can swap in half-and-half. When you pour it into the hot lemon juice it will curdle, but once you stir the sauce together and toss it with the chicken you won’t be able to tell. This basic concept will stand up to a lot of tweaking, so experiment: oregano would be a very Greek-inspired substitution for the thyme, for example, or you could swap the lemon juice for lime, maybe with a bit of chili powder.